Higher resolution, frame rate, and 51 DLCs. Bandai Namco has released the first trailer, screenshots, and opened the official website for One Piece: Unlimited World Red Deluxe Edition. 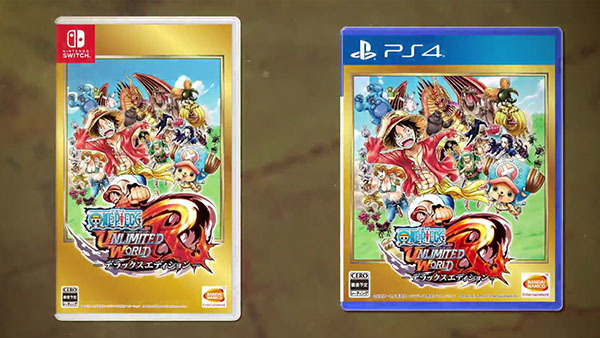 Due out for PlayStation 4 and Switch in Japan on August 24, the game is an upgraded version of the 2013-released One Piece: Unlimited World Red. It runs at a maximum 60 frames per second in 1080p on both platforms (720p in Table and Handheld modes for Switch), includes 51 pieces of downloadable content (costumes and quests) released for the previous version, and supports offline two-player gameplay (including Joy-Con two-player on Switch). Some cast members, such as those for Red and Yadoya, have been changed.